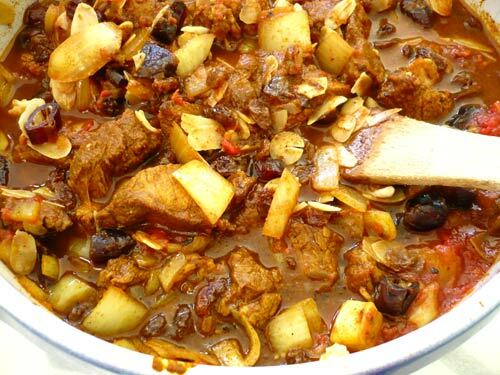 There are many many Moroccan lamb recipes – surprising given that the main meat eaten in Morocco is beef but only because lamb is so expensive. And there are many Moroccan dishes that have couscous as an accompaniment. Couscous is arguably the most recognised Moroccan food. While this recipe looks long and complicated the preparation is quick and simple – you just need time up your sleeve for the long slow cook. I cooked this today (1 November 2009) and have adjusted the spice mix, as the final dish was so hot my family couldn’t eat it. Plus I thought the cinnamon was a bit overpowering. I have left the original quantities in ( ) so if you want to burn the roof of your mouth off be my guest! 1. Preheat the oven to 150ºC. 2. 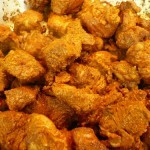 Place the cayenne, black pepper, paprika, ginger, turmeric and cinnamon into a small bowl and mix to combine. 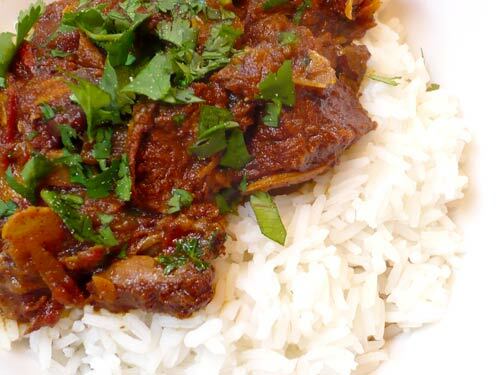 Place the lamb in a large bowl and toss together with half of the spice mix. Cover and leave overnight in the fridge. 3. Heat 2 tbsp olive oil in a large casserole dish. Add the grated onion and the remaining spice mix and cook over a gentle heat for 10 minutes so that the onions are soft but not coloured. Add the crushed garlic for the final 3 minutes. 4. 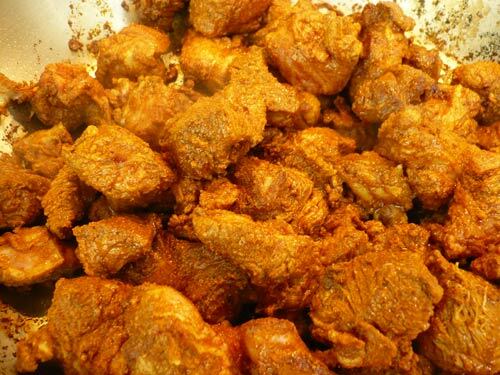 In a separate frying pan, heat the remaining oil and brown the cubes of lamb on all sides then add the browned meat to the casserole dish. De-glaze the frying pan with ¼ pint of tomato juice and add these juices to the pan. 5. Add the remaining tomato juice, chopped tomatoes, apricots, dates, raisins or sultanas, flaked almonds, saffron, lamb stock and honey to the casserole dish. Bring to the boil, cover with a fitted lid, place in the oven and cook for 2-2½ hours or until the meat is meltingly tender. 6. 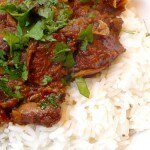 Place the lamb in a tagine* or large serving dish and sprinkle over the chopped herbs. Serve. 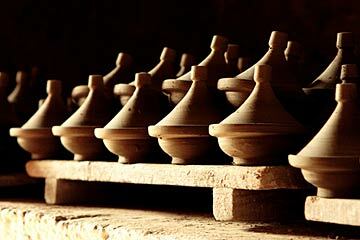 * From wikipedia: Tagines in Moroccan cuisine are slow-cooked stews braised at low temperatures, resulting in tender meat with aromatic vegetables and sauce. 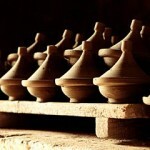 They are traditionally cooked in the tagine pot, whose cover has a knob-like handle at its top to facilitate removal. While simmering, the cover can be lifted off without the aid of a mitten, enabling the cook to inspect the main ingredients, add vegetables, move things around, or add additional braising liquid. 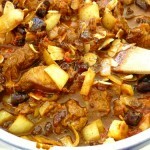 Most tagines involve slow simmering of less-expensive meats. For example, the ideal cuts of lamb are the neck, shoulder or shank cooked until it is falling off the bone.